My preschooler and I have been having fun with simple scissor skills activities lately to strengthen her fine motor skills. We brainstormed all of the things we could think about that relate to St. Patrick's Day and then we've been cutting and taping and gluing to make some cool themed creations. Today we decided to make our very own pot o' gold! 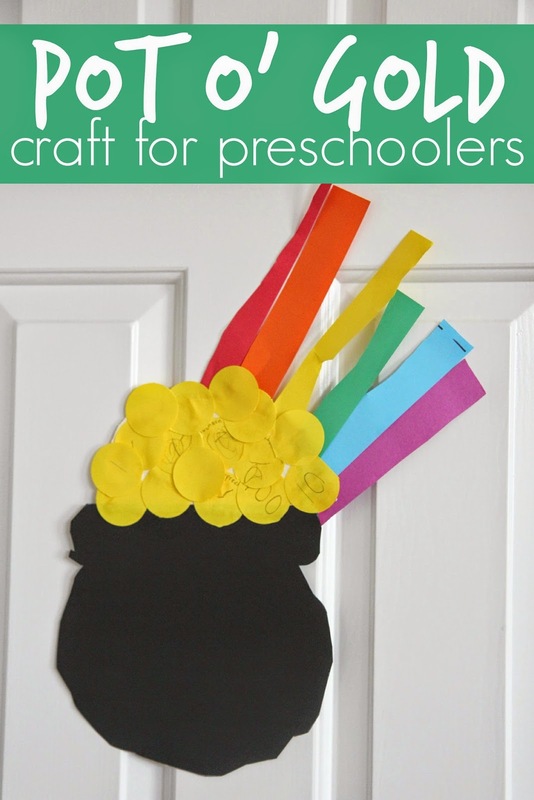 We used scissors and a craft punch for this activity since my daughter loves using both when she is creating. I started off by drawing a large pot on a piece of black paper using a white crayon. Then my daughter cut it out. You can make it really simple or a little more complex by adding more shape to the pot. Next we punched a lot of circles out of our yellow paper to make gold and then we wrote numbers on the gold coins. My daughter thought it was so fun to make coins that said 100 on them. Next I taped a white piece of paper to the pot so that we had somewhere to put our gold coins. My daughter glued the gold coins to the top of the pot until the pot was overflowing with gold! After the pot was done we worked on cutting out strips of paper to make a rainbow coming out of the top of the pot o' gold. The strips were her favorite to cut since they were super simple. Next she organized the strips into rainbow order and then she stuck them onto the pot o' gold. This was such a fun craft project even though it had several steps. Usually we try and do much more open ended craft projects where we are exploring materials and there aren't too many steps required. Lately my daughter has been requesting more structured projects and has a vert specific idea in her head of what she wants to make. We try and do a good variety of both structured projects and process centered projects since I think process centered projects are much better for helping kids develop creativity but sometimes the kids veto me. Since my oldest is in elementary school and comes home with structured projects quite often his little sister wants to copy him. Despite this project being more product centered, it was a fun connecting activity for me and my daughter. I enjoyed sitting nearby while I was helping my older son with his homework and giving her simple tasks to complete in order to finish this project. Do your kids ever ask for projects? Do you have any favorite rainbow themed projects you've tried? We absolutely loved our simple paper rainbow we made last week along with these other cool St. Patrick's Day craft projects.